Saint Lawrence (Lavrenty) the Fool for Christ and Wonderworker of Kaluga, lived in the beginning of the sixteenth century at the distance of half a verst from old Kaluga near a forest church in honor of the Nativity of Christ, set upon a high hill. There was a long underground entrance from his dwelling to the church, where he attended services. 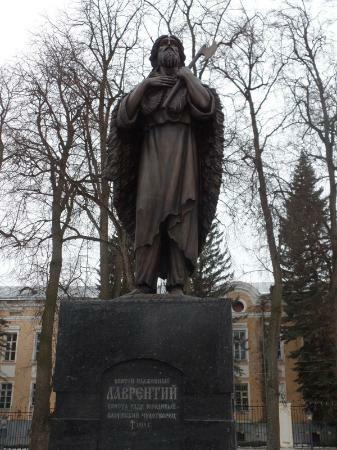 He lived also at the home of the Kaluga prince Simeon Ioannovich. 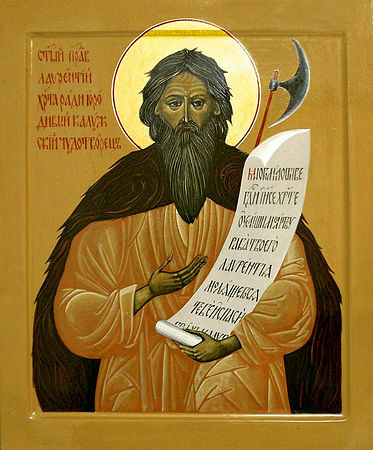 It is conjectured that Lawrence was descended from the noble Khitrov lineage, since his name initiates their lineage memorial at the Peremyshl’sk Liotykov Monastery, in the Kaluga diocese. Laurence went barefoot both winter and summer, in a shirt and sheepskin coat. By his struggles he so raised himself up that while still alive he was glorified by gifts of grace. When the Crimean Tatars fell upon Kaluga in May 1512, Lawrence, then in the home of the prince, suddenly shouted out in a loud voice: “Give me my sharp axe, for the curs fall upon Prince Simeon and it is necessary to defend him!” Saying this, he seized the axe and left. Suddenly having come on board the ship next to the prince, Lawrence inspired and encouraged the soldiers, and in that very hour they defeated the enemy. 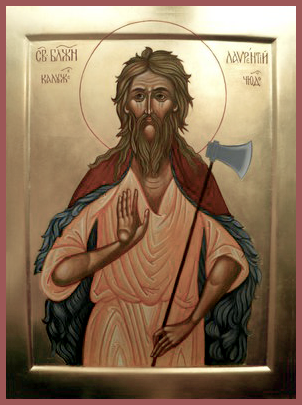 He is depicted in icons with an axe in his hand, set upon a long handle. 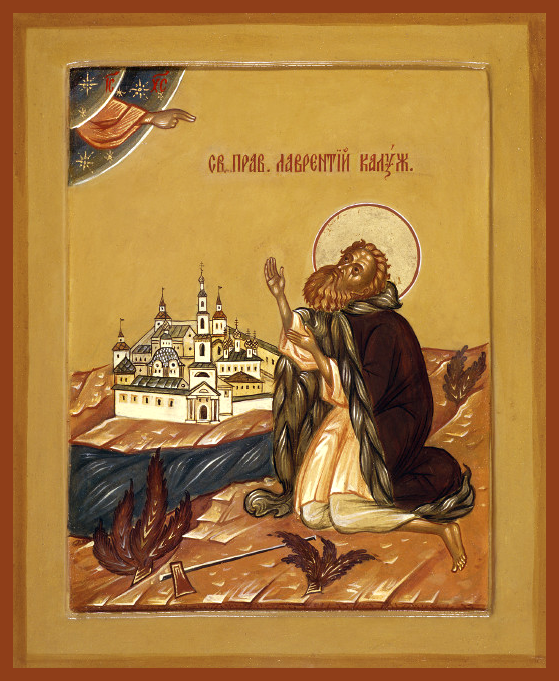 It is certain that Prince Simeon (+ 1518), owing him his safety, built a monastery in his memory on the site of the Saint’s ascetic labors, known as the Monastery of the Nativity of Christ or Svyato-Lavrentiev Monastery. Blessed Lawrence died on August 10, 1515, on the feast of his patron Saint Lawrence the Martyr of Rome. Saint Lawrence was glorified, it seems, in the second half of the sixteenth century. Thus, Tsar Ivan the Terrible in a deed of donation to the monastery (1565) wrote: “Monastery of the Nativity of Christ, where lies Lawrence, the Fool for Christ.” In the Life, the first posthumous miracle is recorded under the year 1621: the healing of the paralyzed boyar Kologrivov, who became well after a Molieben to the Saint. During the Times of Troubles the Second False Dmitri sought shelter here and the monastery was virtually destroyed in subsequent battles. Afterwards the monastery was restored and more stone construction work took place in the 18th and 19th centuries. By the 20th century the monastery had three churches. In 1918 the monastery was closed and later used as a forced labor camp. The monastery's churches were knocked down in 1929. 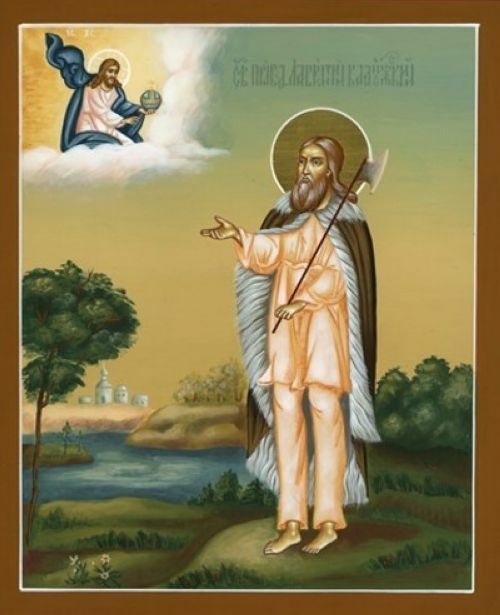 In 1993 a wooden cross was erected over the supposed burial site of Saint Lawrence and the territory and buildings were returned to the Kaluga Eparchy in 1994, which re-established the monastery. The monastery's churches are now in the process of being rebuilt. Between August 20-23, 2015 in Kaluga, there were celebrations dedicated to the 500th anniversary of the repose of the holy righteous Lawrence of Kaluga. On August 22, at the end of the Divine Liturgy, Metropolitan Kliment (Kapalin), Archbishop Maximilian (Lazarenko) of Pesochensky and Yukhnovsky, and Bishop Nikita (Ananiev) of Kozelsky and Lyudinovsky, together with the clergy of the Kaluga Metropolitanate, consecrated the monument to the righteous Lawrence outside the Cathedral of the Holy Trinity. 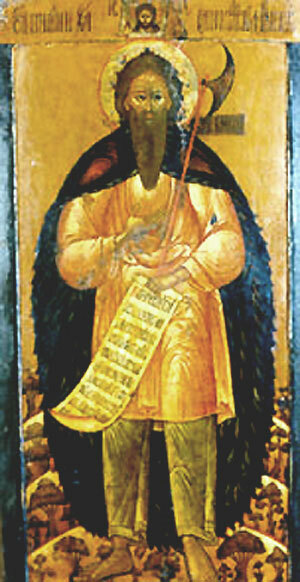 A postage stamp was also issued with an image of Saint Lawrence and his monastery. 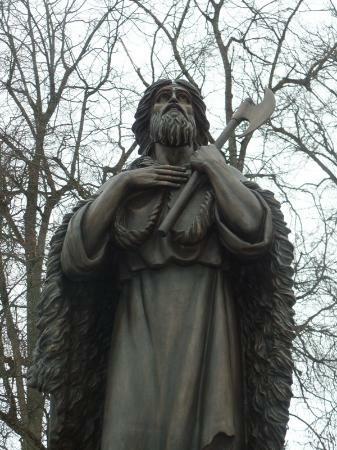 Saint Lawrence is considered the patron of the city of Kaluga.